Hey, guys, in response to yesterday’s January Happy to-do List for Gardeners, I’ve had several requests for Gene’s extensive seed catalog list that he mentioned in the comments. It’s a great list, and I’m happy to share it with you. But first, I must warn you: I woke up to a wind so chill and so gusty that this may be my Last Post Ever. I wouldn’t be surprised if the fierce wind that is blowing–even as I type–just picks up our house and blows it away–to Iowa, or perhaps to one of the Great Lakes, where it might suddenly run out of steam and drop it. But I’m not complaining. At least it’s not 2º like it was yesterday (that was the high). For pete’s sake, it’s 13°! What could I possibly complain about? Okay, I am complaining. If I–and my big drafty cold house–survive this day, you’ll hear from me again. If we end up in the bottom of Lake Michigan, well . . . au revoir, cher lecteur! 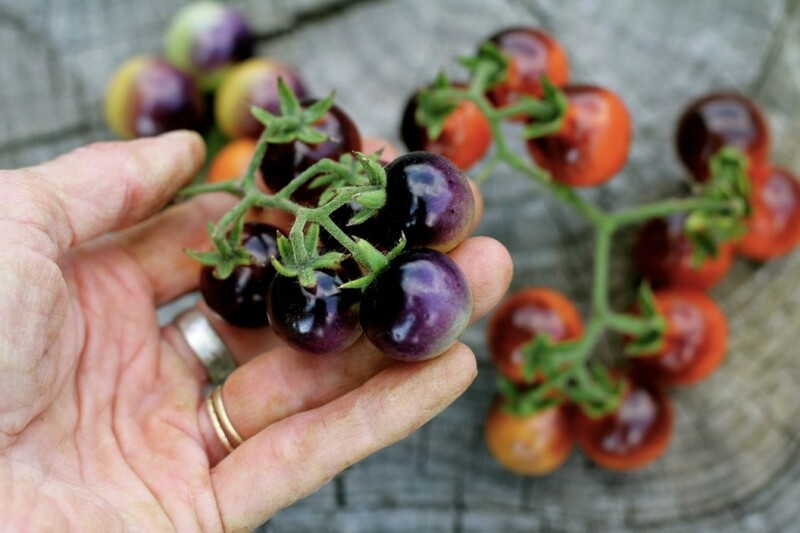 One of my favorite tomatoes from last summer: “Blueberries” tomato seeds came from Baker Creek Heirloom Seeds. Gene is a professional market gardener who currently sells his stuff to fancy restaurants (so fancy that I’ll never set foot into any of them), among other (similarly impressive) things. Herb grower. Garden plant sharer. Jam maker. Garden mentor and all-around Great Guy. You’ll learn more about him later, since he has agreed to do an interview with me in March. See, Gene, I’m holding you to this! 🙂 I’m proud that he is my friend. So, there you go. The GMO stuff is mostly made for the big commercial farmers in the way of soybeans and corn. Gene may laugh at this analogy, but I personally see the non-GMO claims to be parallel to the Gluten-free claims going around. For example: a conscientious (yet not well-informed, perhaps) shopper goes into the store and studies his choices carefully. He sees two types of licorice whips. His eyes light up. He loves licorice whips. But he must choose between the two. One package says “Gluten-free food!” in bold letters across the package. The other one does not. The shopper picks the first one up, assuming that gluten must be a bad thing for him, since so many packages claim proudly that they don’t have it. He looks with disdain at the licorice that contains this awful ingredient, gluten. When would all the food companies learn to leave gluten the heck out, he wonders. Also he has a passing thought: must google gluten and see what it is, anyways. He buys the gluten-free licorice, satisfied that he has made the smart choice, and proceeds to eat the whole package on the drive home. It was a bit much–he feels just a tad guilty about indulging in such a way–but also he feels a tiny bit smug, knowing that he at least did not not ingest gluten, at least. In any case, Gene’s list was in a fancy spreadsheet, and my blog wouldn’t let me just copy and paste it. Stubborn, stubborn blog! I put out a couple of feeble cries for help, early this morning, and got quick answers and practical help from web kid Timothy, and Gene himself. So thanks, guys! But, hey, time’s a-wastin’! It’ll be spring before we know it, right? 🙂 Stay warm today, Gentle Reader! Oh! After all that, I can’t forget the list! Jamie – this is fewer than 25% of the seed companies that my intern came up with. I narrowed it down to this list because I thought – for varying reasons – that each of these companies had something special to offer to the small farmer types that I mentor and hang out with. Many seed companies offer at least some organic, untreated or heirloom seed but the companies on the list make a considerably bigger deal of it. Gene: Timothy actually sent me your original list, all decked out and ready to go into my blog (don’t have a clue on how he did it!) and I decided to go with your list, since I didn’t really think most readers would want that much info. And I just cut and pasted your list and this is the way it came up in my blog. I was pleased! You know, regarding gluten and GMOs–there’s always the “poison du jour” on the public’s radar. And this doesn’t mean that gluten or whatever isn’t difficult for some people to digest, or that some people should avoid salt. Sodium was the devil not long ago, and then coconut oil (remember the big flap about the movie theatre popcorn supposedly causing heart attacks?) and then sugar–people (myself included) need to remember that it’s not fact just because a whole lot of people make a lot of noise about it, or just because somebody somewhere (or some well-meaning blogger, cough) says that they read some research that cast a poor light on something—!! A few years ago, somebody published a study saying that wooden cutting boards should be avoided, because germs and bad bugs could live in the grooves of the cutting boards. I changed my behavior, buying a couple of plastic cutting boards, not using my beloved wooden ones any more, etc. THEN a few years after that, another study said that ACTUALLY the wooden ones were safer to use, because they had some sort of a property that killed the bad bugs that stayed on them for very long: the plastic ones were then no longer considered safe to use, unless you bleached them often. At that, I threw up my hands (literally, I think) and decided to IGNORE ALL STUDIES. (So there!) Blah! It’s the Too-Much-Information-Age! Thank you so much for that great and thorough list of companies who carry non-GMO seeds! Enjoy it, Ruthanne, and a hat-tip to Gene for putting it together for us! Wow, I can’t even think that far ahead right now – here in Maine, we have had similar frigid weather with sub-zero temps and wind chill even lower (-28 a couple nights ago!) Snowed again today, too. But WOW, again – that is quite the seed list!! Brrr, it sounds cold in Maine, too, Karen! I’m trying to figure out what temperature that is because we think in celsius here in Canada 🙂 But I’m guessing it’s really cold! And thanks for sharing that great list. Oh, Salma, I don’t have a Fahrenheit-to-Celcius chart in my head, either. YES it’s cold, though! I’m sure you’re not a stranger to cold weather in Canada, eh? This list is fabulous! I’d like to just wile away several hours looking at plants and making plans! Would you please come over and link up with us at Home Matters Linky Party. This is the kind of information folks like to Pin for future reference. Thanks for sharing!